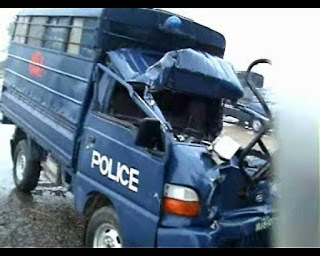 Four Policemen were killed when vehicle turned turtle. After the accident nearby people called the police and rescue teams. They reached the spot on information and shifted the victims to DHQ Hospital Sheikhupra and Lahore General Hospital. In a tragic incident of a road traffic accident, four police official died while four others were injured on GT Road Sheikhupura. An arrested suspected proclaimed offender is also among the injured. The officials identified as sub-inspector Muhammad Islam, trainee ASI Asadul Rehman, head constable Mujahidul Hassan, constable Kausar, police van driver Akbar Khan, Tafheem Mehdi, Shahid Mehmood, Amir Sajjad, Akram, Ghulam Mustafa and Musharaf were returning after arresting the accused person identified as Aslam from Faisalabad. As the team reached near Nishat Mill Jando Stop Faisalabad Sheikhupura Road, the front tyres of the vehicle burst with a huge blast. The vehicle overturned and the people inside the vehicle suffered injuries. Two police officials died on the spot while two others died while on the way to the hospital and during treatment. The deceased were identified as Sub-Inspector Ghulam Mustafa, ASI Asadul-Rehman, Head Constable Mujahidul Hassan and constable Kausar. Sub-inspector Ghulam Mustafa died at Lahore General Hospital. He was posted at Barki police station and had taken the lift for coming back in the van. While expressing grief and condolence over the demise of police officials in the traffic accident, Inspector General Police Punjab Amjad Javed Saleemi directed CCPO Lahore that the families of the deceased officials should be looked after and best treatment should be provided to the injured officials. 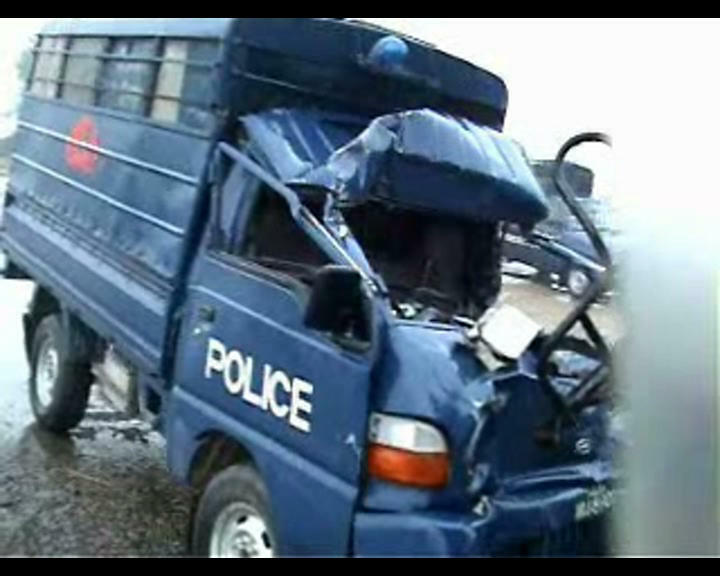 South Punjab News : Four Policemen were killed when vehicle turned turtle.